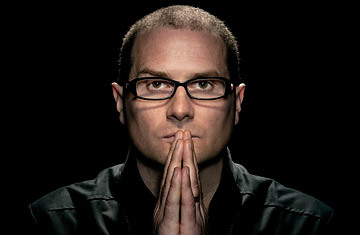 As you all know I'm not a fan of Rob Bell. Whatsoever. The reason I'm not a fan of what he does because he goes out of his way to make biblical Christianity look stupid, out of date and stuff that 'normal people' should avoid. They mock the Bible itself, it's in a very covert way, but they are mocking the holy scriptures in an attempt to be funny and witty...this is wrong, and I'll go a step further to call this wicked. He makes parents that take Deuteronomy 6 seriously about guarding their children's minds against unbiblical things and setting them on a path that glorifies God look so outdated and archaic. He is literally attempting to shame parents who are giving their children the tools to live out a Biblical worldview. This is very, very concerning. But this is how the devil does his work. He knows that selling you an out and out lie is difficult, but if he sprinkles in humor and along with that project out that you're educated and sophisticated and enlighted then people will buy into that lie. On his website, Rob tells us about his new book that explains the Bible in a way that so many have missed. He tells us "Some people see the Bible as an outdated book of primitive, barbaric fairy tales that we have moved beyond. And so they ignore it, missing all of the progressive and enlightened..."
See that sounds really good doesn't it? But many of us might miss what he's saying here. These two words stuck out progressive and enlightened. You see Progressivism is the support for or advocacy of social reform. AKA liberalism in disguise. It sounds good, but it will do its dead level best to destroy the underpinnings of the Scriptures. These are buzz words that have such deeper meanings. They are anti-Bible and anti-Christ. The reform they seek is not going after the Glory of God like Martin Luther looked for, but rather they want to destroy the very Book that God says brings life and freedom. The devil knows if he can distract and confuse then he's got you. The devil knows that if he can keep people away from the Bible or make it look like it's something silly then he's got them. Sadly so many are falling for this. God through the Prophets and the Apostles literally wrote out Scripture as there were lead by the Spirit. This includes the Old Testament and the New Testament. The scriptures are 'God-breathed.' Scripture is the FINAL authority of our lives. If you can't align yourself up with that it is you who are in sin and it is you that need to rethink your position. This man is a wolf in sheep's clothing and he is deceiving so many people. AVOID HIM! THIS 'INTERVIEW IS STAGGED AND A MOCKERY TO THE THINGS OF GOD.